Financial Aid: 94% of Canisius students qualify for generous financial aid/merit packages. Steeped in Jesuit ideals, our undergraduate academic programs are distinguished by academic excellence, student-faculty interaction, and a variety of experiential learning opportunities that engage students and transform the mind and spirit. Our academics are challenging. Curiosity is encouraged. Thinking, required. Students undertake real-world experiences, participate in scholarly research, and tackle complex problems. Canisius students can choose from more than 1,000 courses in 100 majors, minors, and special programs. Benefiting from an 11:1 student-faculty ratio, they study in small classes with distinguished faculty. Styles of instruction include lively discussions and lectures. Students are challenged to discover and debate practical and ethical issues. They stand elbow-to-elbow with faculty to conduct their own research. Those same faculty capitalize on the College’s dynamic urban campus to turn everyday occurrences into meaningful learning experiences. Students travel to select neighborhoods to help improve struggling schools; study animal behavior up close at the Buffalo Zoo, just blocks away from campus; or examine the impact of security on international trade along the US-Canadian border in Buffalo. Students’ learning environments expand beyond Buffalo as well. They refine their journalistic skills in the corridors of Congress, visit sites of German concentration camps in Poland, and follow in the footsteps of renowned primatologist Jane Goodall in Tanzania. Canisius College’s flexible programs let students match courses with their aptitudes and attitudes. Some choose to combine Marketing with International Business to help stimulate trade between rural Mexico and Western New York. Some pair Philosophy and Environmental Studies to investigate the impact of lead paint on children who live in low-income housing. Others study Physics, Music, and Digital Media Arts to design new and innovative digital electronic instruments. Founded in 1870 by German members of the Society of Jesus, Canisius College is a private liberal arts institution conducted in the Jesuit tradition. The College offers a concentrated liberal arts core to help students focus their personal philosophies. A high priority is placed on inquiry and intellectual growth. The varied learning experiences are world affirming and focus on educating the whole person—intellectually, spiritually, emotionally, and physically. Students are trained to think critically about their place in and responsibilities to the world. 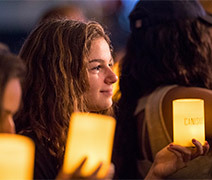 In keeping with Jesuit tradition, Canisius College exemplifies the phrase “men and women with and for others.” Service learning courses put students in neighborhood settings where they are exposed to their field of study while giving back to the community. During semester breaks, groups of students and faculty embark on service immersion trips around the world to serve people in India, Jamaica, El Salvador, and Ecuador. The staff and faculty encourage students to strive for magis, a Latin term meaning “more.” Through the core curriculum, service, and reflection, students are asked to give more of who they are. The goal is to grow as an individual and help develop the community around them. When Canisius students aren’t working hard, they take advantage of opportunities to play hard. The College is home to the Golden Griffins, with 20 NCAA Division I athletic teams and 29 club and intramural sports. There are over 90 student-run clubs and activities on campus, dedicated to everything from academics to performing arts. Buffalo is home to professional football and hockey teams, minor league baseball, and a world-champion lacrosse team. An easy walk puts students in Delaware Park, one of Frederick Law Olmsted’s most beautiful parks, where they can bike, play tennis, golf, or rent boats on scenic Hoyt Lake. 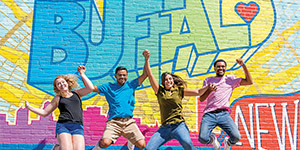 With shopping, restaurants, theaters, world-renowned art galleries, and live music just a subway ride away, students soon learn why Buffalo is one of the top five college towns of its size. When it’s time for rest and relaxation, Canisius offers some of the most comfortable and spacious suites and apartment-style residence halls around. 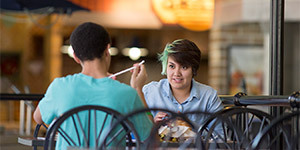 Students can choose from a range of meal options at the dining halls and campus snack bars, which include Tim Hortons and Starbucks. Canisius looks for students who are passionate, motivated, hardworking, and interested in making a difference in the world around them. Canisius sets the academic bar high and encourages students to challenge themselves, try new things, and pursue goals that not only focus on academic excellence but also personal and professional growth and development. Whatever students choose to do, rest assured they will go on to live their passion and make a difference. We hope to see you on our campus to learn how Canisius College can help you achieve your goals, fulfill your passions, and provide an exciting and meaningful college experience.